Group project with Alexis Turim, Alyssa Celentano, and Sarah Healy. Prompt: Create a digital innovation within education. My primary role within the group, described as "visual scribe", was to visually document our process. 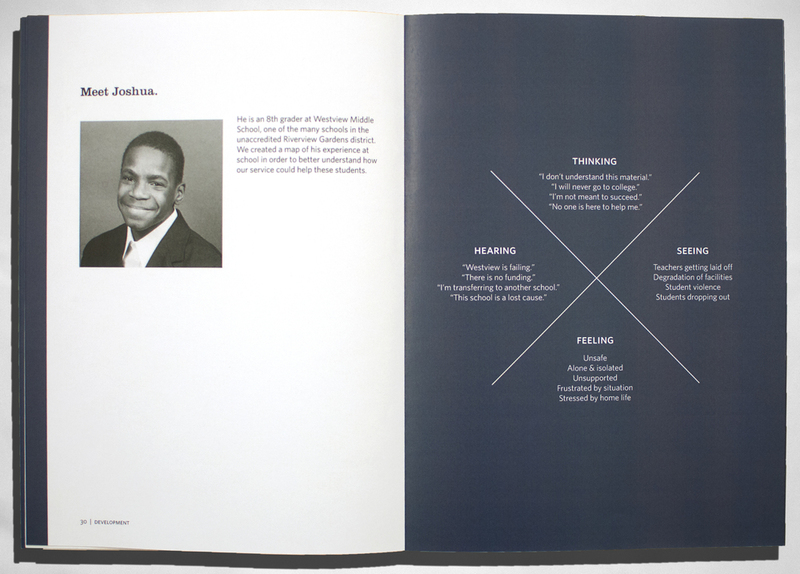 A final book compiles our research, concept development, and showcases the final product. The cover states the very first question our team wanted to learn more about. Currently over 30,000 students in Missouri attend schools in unaccredited districts. Most of these schools are in impoverished, dilapidated neighborhoods such as this one in St. Louis. The blatant neglect of education in Missouri is revealed through standardized test scores. Statewide, almost half of 4th grade students are below basic reading level. And, unsurprisingly, poverty is on the rise. Amazingly, members of the community have come together to show support for students in need. Below, alumni of the now unaccredited Normandy High School cheer on students as they start their first day of a new school year. How can we extend this community support beyond the first day of school? What factors determine a child's achievement? We interviewed experienced educators and mentors to find out. Who is our user and what is he/she experiencing? What existing digital tools can we integrate? 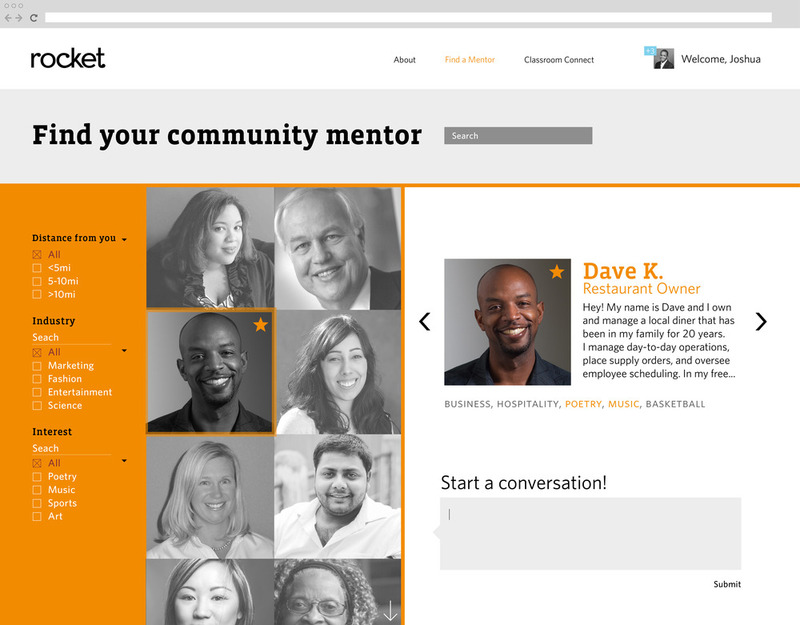 Rocket is a social media site that connects classrooms to communities, giving students a network of support as they pursue their education. Through Classroom Connect, teachers can collaborate with another classroom in Missouri and link their students together. Both contribute to online discussion and assignments, creating a support network beyond the immediate community for both teachers and students. Through the mentor-finder, students can connect with local community members that align with their own goals and aspirations. Round, sans serif type and bright colors cater to the students we support, enforcing a positive attitude and conveying our enthusiasm towards their education.